I have no idea why I didn’t do this sooner. I love chili and I always make it in a big crock pot batch, which means I always have leftover chili. Why did it take me so long to pour it all over some tasty oven baked parsnip wedges? Sometimes I wonder where my mind wanders off to when it’s busy ignoring such an obviously awesome idea. Originally, I was going to make this with sweet potatoes. Which I’m sure would also be a party in your mouth. But there’s something really fantastic here about the more subtle sweetness of the parsnip wedges, since they’re balanced by that homey, comforting earthiness, too. Sure, you can just roast the parsnip wedges after tossing them in a little oil. But I’ve found the best way to make parsnip wedges is to parboil them a little first. Why? It really helps to break down the fibrous center of the parsnip root. Which means you don’t have to oven roast them for as long as you might think, or risk burning them while trying to cook them through. Peel your parsnips and chop off the ends. Cut each parsnip in half widthways so that one half of the parsnip is the thicker fuller top end and the other half is the skinnier bottom end. Cut the top ends in half lengthways, then cut each half again into quarters. Cut the bottom ends in half lengthways, then cut into halves again. Add the parsnip wedges to a pan of hot salted water. Bring to the boil and cook until just tender, about 8 minutes. Drain the parsnip wedges and lay they out onto a clean cloth to dry. Don’t wrap them in the towel: just let the steam escape. Mix together your oil and seasoning mix in a large bowl. Once the parsnips are dried, stir them through the seasoning mix so that they are evenly coated. Lay the parsnip wedges on an oven safe metal wire rack that is resting on a half sheet baking tray. Space them out evenly so they don’t touch. Roast the parsnips for 20 minutes. Flip or move any parsnips that are beginning to over brown. Return to the oven for another 5 – 10 minutes, until they are evenly browned. It looks like way more effort than it is, don’t worry! But this is the best way I’ve found to make not-too-chewy-in-the-middle parsnip wedges! Now all you need to do is top them with your favorite chili. I garnished mine with some extra chopped green onions and jalapeños – you can add whatever extras you fancy! This recipe is Whole 30 compliant – as long as your chili recipe is! Here’s my big batch crock pot chili recipe. Most people think of potatoes when it comes to wedges. 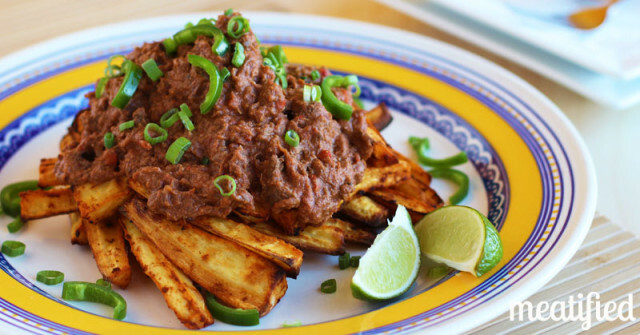 Try these parsnip wedges instead, topped with delicious chili for a warming & comforting dish. Put a saucepan of salted water onto the stove, ready for boiling your parsnips. While the parsnips are parboiling, preheat the oven to 425F. Lay the parsnip wedges on an oven safe metal baking rack that is resting on a half sheet baking tray. Space them out evenly so they don’t touch. Warm through your chili, then top the parsnip wedges with the hot chili before serving. This recipe is Whole 30 compliant. Sounds wonderful? Do you have a recipe or recipe link for the chili used here? It looks great! This looks great! Do you know how to get the “earthiness/bittnerness” out of parsnips? The only way I’ve ever found is to coat them in a tonnnn of coconut oil and then baking them. However, my body isn’t digging coconut oil lately so I’ve been sticking with olive. It’s not as strong and I still taste the bitterness. Have you tasted what I’m mentioning?